I haven't done much hiking lately, but I finally got myself back out onto a local trail yesterday for about 2 hours. 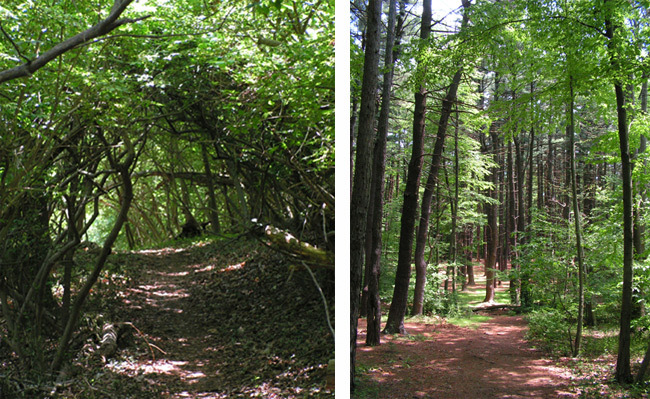 Here are two scenes; a bit of a tree tunnel, and a pine grove (too bad computers can't convey that subtle but wonderful smell of a pine grove). Enjoy! Lovely, lovely pictures! Just gorgeous! What an enjoyable time you must have had. The more I look at your pix, the more I appreciate how beautiful they are.